Description: This coniferous tree becomes 80-120' tall at maturity, forming a stout central trunk and an oblongoid crown. The central trunk is somewhat swollen at the base and buttressed; when a tree grows in a location that is flooded during several months of the year, it often develops 'knees' that help to stabilize it. These knees are an extension of the trunk that protrude from the water around its base. The major branches of the crown are more or less horizontal and widely spreading. Trunk bark is reddish or brownish gray and rather thin. With age, it has a tendency to peel off the trunk in narrow strips. The bark of smaller branches are reddish brown and more smooth. There are two kinds of twigs: deciduous and non-deciduous. Deciduous twigs remain green and develop needle-like leaves in 2 ranks, resembling a compound leaf with pinnate structure. Non-deciduous twigs become reddish brown and develop deciduous twigs with leaves. Individual leaves are light to medium green, ¼–¾" in length, narrowly linear in shape, and flattened in cross-section. They have a feathery appearance and soft texture. Bald Cypress is monoecious: individual trees produce either all male cones (pollen-bearing) or all female cones (seed-bearing). Male cones are produced in drooping panicles about 5-10" long. Individual male cones are 1/8" (3 mm.) across and sessile (or nearly so). Each tiny male cone is ovoid-globoid in shape, consisting of a few appressed scales and pollen-bearing structures. Female cones are produced individually or in small clusters. Individual female cones are about 1" across and nearly sessile. Each female cone is globoid in shape with a wrinkled surface, consisting of about 12 irregular scales that are appressed together and non-overlapping. During the spring, the cones are cross-pollinated by the wind. At maturity, the female cones change from green to brown and begin to disintegrate, releasing the seeds. There are 2 chunky seeds at the base of each scale. Individual seeds are about ¼" long, 3-angled, and irregular in shape. Seeds can travel some distance by floating on water, otherwise they don't wander far. The root system is woody, consisting of a taproot with lateral roots; the latter are shallow, but widely spreading. This tree reproduces by reseeding itself. It sometimes forms colonies and becomes the dominant tree at favorable locations. During the autumn, the deciduous leaves turn yellow or brown and fall off the tree. Cultivation: This tree prefers full sunlight, wet to moist conditions, and a somewhat acidic soil containing muck, clay, or sand. Unlike most other trees, it can tolerate waterlogged conditions for several months per year. Growth and development are fairly slow, but individual trees can live 200 years or more. Some trees in the southeast are suspected of being 1000-1500 years old. The seeds need consistently moist conditions in order to germinate. It is possible to plant Bald Cypress in areas that are located north of its normal range – depending on the local ecotype, it is winter-hardy to Zone 4 or 5. Range & Habitat: In Illinois, native populations of Bald Cypress are restricted to southern Illinois, where it is uncommon to occasional. Illinois lies along the northern range-limit for native populations of this tree. Habitats include bottomland woodlands along major rivers, soggy wooded areas along lakes, and swamps. Sometimes Bald Cypress is the dominant tree in swamps, or it is codominant with Water Tupelo (Nyssa aquatica). During dry spells, stands of Bald Cypress are sometimes killed by wildfires, as the thin bark of these trees provides little protection. 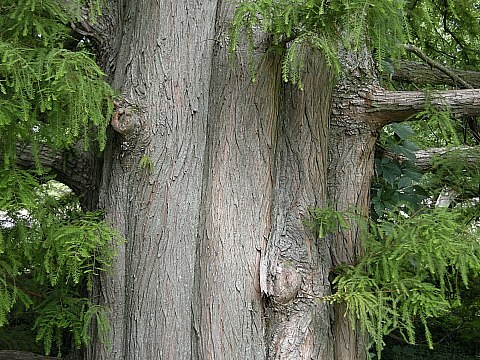 Sometimes Bald Cypress is grown as an ornamental landscape tree; naturalized populations of this tree will probably occur from escaped cultivated plants in the near future. Faunal Associations: Bald Cypress appears to have fewer insect pests than most trees. Insect feeders that are known include the moth caterpillars Chloropteryx tepperaria (Angle-Winged Emerald), Isoparce cupressi (Bald Cypress Sphinx), Malacosoma disstria (Forest Tent Caterpillar), and Nemoria elfa (Cypress Emerald). The larvae of the Buprestid beetle, Acmaeodera pulchella (Flat-Headed Bald Cypress Borer), bore through the wood, as do the larvae of the Cerambycid beetles Atimia confusus confusus, Leptura abdominalis, Oeme rigidus rigidus. Several oligophagous (or monophagous) plant bugs also feed on Bald Cypress; these species include Ceratocapsus taxodii, Orthotylus taxodii, Parthenicus taxodii, Phytocoris exemplus, Phytocoris taxodii, and Pilophorus taxodii. The seeds are eaten to a limited extent by such birds as the Wood Duck, Gadwall, Mallard, and Wild Turkey; they are also eaten to a limited extent by tree squirrels. Bald Cypress provides good nesting habitat for several species of birds; this includes the Ivory-Billed Woodpecker, Pileated Woodpecker, Bald Eagle, Osprey, Yellow-Throated Warbler, and various herons and egrets. In swampy areas of southern Illinois, Barred Owls often roost in this tree. Photographic Location: The Arboretum of the University of Illinois at Urbana, Illinois. Comments: This coniferous tree has very soft and attractive foliage during the summer and odd-looking wrinkled cones that are spherical in shape. It does appear rather barren during the winter after its leaves fall to the ground, however. In southeastern United States, the branches of Bald Cypress are often draped with Spanish Moss (the latter is actually a flowering air-plant, or bromeliad), but the range of this mossy plant doesn't extend as far north as Illinois. 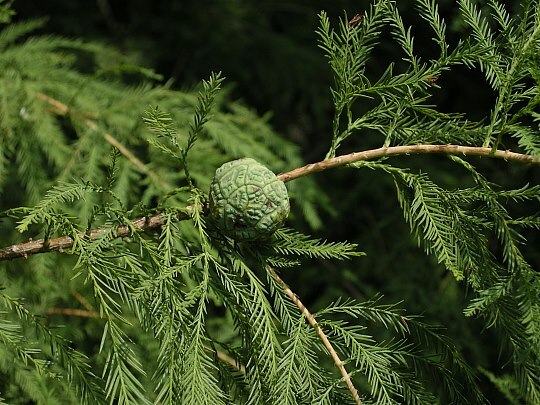 Bald Cypress superficially resembles another coniferous tree, Eastern Hemlock (Tsuga canadensis), because their needle-like leaves are similar in appearance (flattened & 2-ranked) and soft in texture. However, Eastern Hemlock has more conventional female cones that are ovoid in shape with overlapping scales. Furthermore, the ranges of these 2 species don't overlap as Eastern Hemlock is primarily a boreal species that prefers cool climates. There is a variety or subspecies of Bald Cypress, Taxodium distichum imbricarium, sometimes referred to as 'Pond Cypress,' that has overlapping scale-like leaves up to 1/3" (8 mm.) long that are terete, rather than flattened. Pond Cypress is restricted to the Gulf region of southeastern United States, where it often intergrades with Bald Cypress.